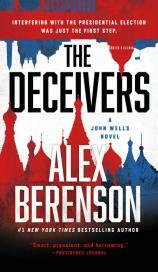 Alex Berenson brings us THE DECEIVERS, his 12th John Wells novel, with a few minor changes. Wells is unusual as far as thriller protagonists are concerned. He is a CIA operative, a practicing Muslim convert, and is off the books but not off the leash. His relationship with his nominal boss --- Vinnie Duto, former CIA head and current President of the United States --- remains edgy, a marriage of politeness and necessity. And he’s old, as far as operatives go, clocking in at somewhere over the perilous age of 40. What is different in THE DECEIVERS is that Wells has a new handler; his old handler, Ellis Shafer (a bit long in the tooth himself, given that he is in his eighth decade), engages in a bit of field work himself. Wells is also aided and assisted throughout most of the book by an old friend. And he is conspicuously off the page for a good deal of the novel. There are a lot of moving parts here, and it’s a credit to Berenson that all of them work together. "Revealing one thing would lead to revealing another, and ultimately I might give away too much of this wonderfully and carefully constructed plot that Berenson must have taken months and months to get just right." In the past, Berenson has seemed prescient in predicting events that occur within a few weeks or months of the publication of a new volume. That doesn’t happen with THE DECEIVERS. The cover blurb attempts to capitalize on the chatter concerning Russian involvement in the 2016 elections. But this is a riveting enough book on its own without being jammed into a hole that just doesn’t fit. So what does happen in THE DECEIVERS? All sorts of things, actually. What is supposed to be a terrorist sting operation manipulated by the FBI turns out to be the real thing. Catastrophe results. President Duto, who campaigned on the premise that he had the experience to keep the United States safe, seems to be a failure. A populist candidate rises from the opposition party and appears ready to ride public outrage all the way to the White House. Readers know more than Wells, Duto and Shafer, but they don’t know everything, not by a long shot. Wells is chasing a lead across North and South America and back again, which may provide knowledge --- and evidence --- as to who or what was behind the terrorist attack. Meanwhile, a retired combat sniper is being ruthlessly and expertly manipulated by his lover, a woman who appears to be as emotionally damaged as he is but has a much longer and deeper endgame in mind. Then there are the Russians. No matter what you think they are planning, and how they will execute it, you will be wrong, and it will take reading through a good deal of the book to get you to the heart of it. I haven’t included all of the issues involved in THE DECEIVERS, not by a long shot. Revealing one thing would lead to revealing another, and ultimately I might give away too much of this wonderfully and carefully constructed plot that Berenson must have taken months and months to get just right. I wasn’t sure precisely what was going to happen at the conclusion until...well, I reached the conclusion. And while the book is complete in itself, it leaves a plate or two spinning at the end, so you’ll have to get the next installment (probably in 2019) to see what happens. But you’ll do so happily.